While it’s already been a while since I finished the first 3 volumes of DRRR! 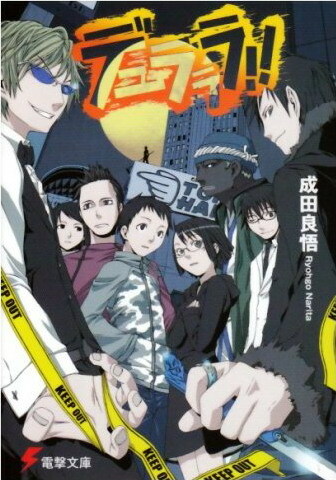 !, or Durarara, I somehow did not have the energy to write an actual entry about any of the books. But now that the anime has started into a new arc and I finally caught up with the anime, I decided to review the first novel and draw some comparisons to the anime adaptions. Be warned, I’m not that fond of the adaption, but I’m also going to try not to enter into a rant, like it has become staple for many blogs recently when it comes to adaptions. Still I think DRRR!! is a capable Light Novel and could have been executed better. But for that, please read on…When reading the first novel I was immediately reminded of Kadono Kouhei’s Boogiepop series. While DRRR!! is not as dark or bloody in tone, it surely shares some of the sarcastic humor and the quirky cast of characters who all somehow connect in a larger city through the appearance of a mysterious person known from an urban legend. What in Boogiepop was the titular spectre, is the headless rider in DRRR!!. Actually one of the first few characters we come upon is that very person and it is through this rider’s quest in search of something precious that the plot seems to be set in motion. The story seems rather strange at first. We have a slightly mad teenager smashing his stalker, a crazy information broker who toys with girls, a seemingly headless biker in search for its head, a gang with members over the whole city and a young boy who recently moved there, to Ikebukuro, to escape his boring country life. At first one might ask how those stories connect and some of them don’t during the first volume, but still it was a highly entertaining read and it flew by without much effort. The story is actually quite well constructed and the reader has ample chance to guess along what actually might have happened. There are several clues to the actual truth behind those mysterious events in the chapters, each being told from a different point of view. Some things don’t make much sense until later in the novel, but I found that rather intriguing as it kept me hooked through the less thrilling parts as well. If you are a friend of mystery literature and are searching for a relaxing read for a rainy afternoon or a boring train ride, the novels are both entertaining and easy to read, so I recommend them to any LN reader who might have already enjoyed Boogiepop or Narita’s other series Baccano!. But how about the anime adaption which is recently gaining fame among the anime community? From here on follow spoilers, so if you don’t know anything I’d recommend you to stop reading here. The anime decided to ditch the plot-order of the novel and went for a more character based approach. I assume because they already knew about the popularity of certain characters, they decided to introduce them and their basic premises earlier on. Especially Shizuo, Kida and the 切り裂き魔 (Slasher) fall under that. This, at least for me, has lead to some uneven parts in the anime, as their are longer stretches where nothing connected to the actual plot happens, so they had to through things in that either do not happen in the novel or happen later on, to keep at least Celty on track. But the plot of volume one, involving Namie and her plot to save her brother was largely slowed down by that. When the ending of the first arc came it felt rather unimpressive as so many things had already been touched in the anime. The anime feels a bit unsteady to say the least. It keeps shifting from one plotline to another, without them being that much connected, apart from Celty and the Nebula Corporation. I liked it how there was always concentration on certain characters in a certain novel and the others stepped down a bit. The anime makes me feel like they desperately want to throw in as much CeltyXShinra and Shizuo vs. Izaya as possible just to keep the fans going. Bantora did a similar approach by actually fusing the first and fifth volume during the first arc of the anime, but it made sense, because it actually sped up some plot developments and gave them at least a little bit more time during the anime’s climax. While I agree that DRRR!! is a largely character centric story, the individual plots were always what I liked at least second most to the main character of the individual volumes. I think it’s sad how they are stretched and deformed, just to give the characters as much different spotlight as possible. ~ by seizonsha on 2010/04/18.